Manufacturing and sales of textiles are global activities that have a major impact on our planet. Environmental impact arises throughout the manufacturing chain – from raw materials to finished product. Fristads wants to make a difference. As part of this initiative we are launching Fristads Green. A new concept where the entire manufacturing chain is characterised by environmental awareness and innovative solutions to minimise the footprint on the environment. First up is a collection for craftsmen during autumn 2019. 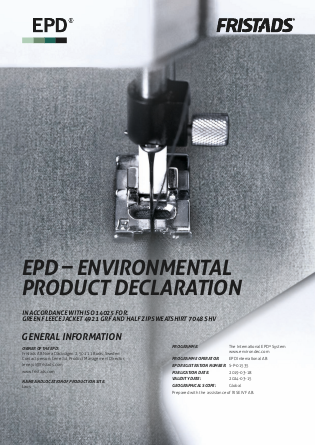 An Environmental Product Declaration (EPD) shows a product’s accumulated environmental effect through its life cycle. Fristads has made the world’s first EPDs for clothing. We have developed a new standard for measuring the total environmental impact of a garment. A standard that can be used throughout the textile industry. EPDs are already used in other product areas, but Fristads is the first to implement it for clothing. The garments are specially designed, featuring advanced folding that reduces sewing time and avoids unnecessary waste. They have a clean design involving minimal details and smart solutions, which saves energy in production and facilitates recycling of the material. The materials are recycled polyester and undyed cotton. The polyester is dyed using the e.dye® process, which reduces water consumption by 75%. All garments are also OEKO-TEX® certified. Buttons are made of raw finished metal alloy, using a metaltreatment method that cuts water consumption. Most of the zipper and all details are made of recycled polyester. An environmentally sustainable process for dyeing fabrics which reduces water consumption by 75% compared with traditional dyeing. The colour is added to the raw material before it becomes yarn and gives superior colour performance because the colour is inside the yarn. We reuse all waste material from production. Surplus material from all Fristads Green products are utilised on site and are turned into “comfort pads” – a bonus product for elbows and knees. In order to avoid the use of plastic bags, garments are folded using a special folding technique. This also means they take up less space, allowing us to make optimum use of transport capacity. All transports take place by boat and car, which have a significantly lower environmental impact than air travel. The world's first trousers with an EPD (Environmental Product Declaration). The entire manufacturing chain is characterised by environmental awareness and innovative solutions to minimise the environmental footprint. Unique workwear trousers made of a durable and comfortable material with contemporary fit. Equipped with all the features and functions a craftsman needs, including CORDURA® reinforced pockets and knees. “Comfort pads” for knees, made of surplus material from the production, are included. The world's first jacket with an EPD (Environmental Product Declaration). A unique workwear jacket made of a durable and comfortable material with contemporary fit including CORDURA® reinforced front and elbows. Comfort pads” for elbows, made of surplus material from the production, are included. The world's first fleece jacket with an EPD (Environmental Product Declaration). Made of 100% recycled polyester in a striped fleece material with contrast coloured details and zipped pockets. The world's first T-shirt with an EPD (Environmental Product Declaration). A unique functional T-shirt made of 100% recycled polyester which transports moisture and is quick drying.